Notes: Starfleet had always intended the Type 6 to be something of a transition, and by 2370 they where satisfied that the new technology had been introduced without difficulties. It was therefore decided to press on with a replacement which would abandon the Type 3 structure, instead using a completely purpose designed hull. Originally it was planned to use the same isolinear computer system developed for the Type 6, but at the last moment Starfleet decided to use a system based on bio-neural gel packs. 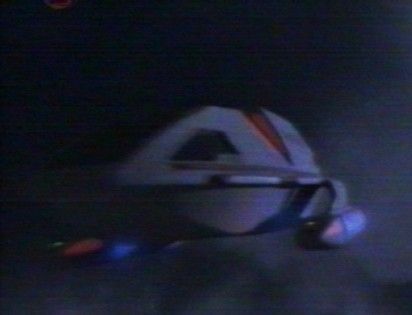 This inevitably tied in the development of the Type 8 shuttle to the Intrepid class project; Intrepid herself had been launched in 2370, the first Starfleet ship fitted with BNG computers. Since the crews of these ships had the most experience with this system, it was to the Intrepids that the first group of production Type 8's where sent in 2371. When discussing the Type 8, comparisons to the Type 6 are inevitable. The Type 8 is slightly longer and more streamlined to increase the operating efficiency within planetary atmospheres and to provide slightly greater internal volume. The nacelles are of a considerably more advanced design and include Bussard Collectors which allow self-replenishment of the Deuterium tanks and so allow the range to be extended almost indefinitely at Impulse speed. A considerable improvement in warpfield efficiency has also allowed much higher warp speeds to be achieved in the Type 8. Internally the layout is virtually identical to the Type 6, although the field of view for the crew has been somewhat reduced and there is slightly more room in the passenger compartment. The use of an integrated hull design rather than the 'bolt-together' sections of the Type 6 has led to an increase in the overall structural strength of some 15%, and has extended the expected hull life from 45 to 60 years. As with the Type 6, the standard Type 8 carries no armament but there is a special operations model. This is equipped with the same low capacity shield system, but has Type V rather than Type IV phaser emitters. The special ops version of the Type 8 also features several classified measures to reduce the radiated energy signature virtually to nothing and so make the craft much harder to detect. Although Starfleet policy forbids special operations craft from operating without markings, the Type 8 special ops shuttles are usually completed in a black colour scheme with markings in a slightly greyed shade which makes them virtually impossible to identify from more than a handful of meters away. The Type 8 has proved extremely reliable and useful in service; the original plan was to replace the Type 6 in frontline service, relegating that shuttle to less important theatres and eventually replacing it altogether. However, with the Dominion war ongoing it has been decided to retain the Type 6 in service alongside its more modern successor. Production of the Type 8 continues, but it is thought that the proportion of these craft produced to the special operations standard has risen from 1% to over 75% since the outbreak of the Dominion war. This would make the Type 8 Starfleets standard near-system and in-system special ops craft.